You buy the official pre-order of the game key PRO EVOLUTION SOCCER 2019. After the first purchase, you receive a discount for all subsequent purchases of our goods. 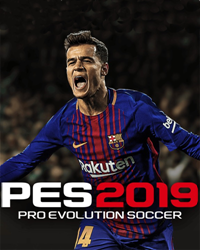 Immediately after payment to the e-mail indicated when purchasing, you can contact him on the release date of the game on August 30, 2018, the PRO EVOLUTION SOCCER 2019 key will be available. • REAL LEAGUES - a large number of new licensed leagues. • MAGIC MOMENTS - the individuality of the players has become even more unique thanks to 11 new skills. • BEAUTY OF THE GAME - appreciate the most realistic animation and support for 4K HDR. • SEASON LEAGUE OF MASTERS - immerse yourself even more in the life of a football coach with completely new functions of the game. 4. After activation of the game from pairs. We sell products of such companies as 1C, New Disk, Soft Club, Buka, Akella, etc. All keys purchased from us are licensed, guaranteed workers and have not been used anywhere else. спасибо за скидку в 2%, буду еще покупать!